Parasites like human intestinal worms are a far more common problem than most people realize. Here is how parasites can enter your body and some of the main symptoms of tapeworm and other parasitic infections. Also ahead is a natural remedy for intestinal worms in humans, based on a traditional German parasite treatment using raw pumpkin seeds. The pumpkin seed contains a substance called cucurbitin that treats worms and other parasites by paralyzing them so they can be expelled from your body. You can use the pumpkin seed treatment ahead for human intestinal parasites like tapeworm, ascariasis, pinworms and ropeworm and it may also help with worms in dogs. First though, a look at the parasite problem and some of the most common symptoms of parasitic intestinal worms. Parasites can enter your body through contaminated water or food (particularly meat like pork or uncooked fish), mosquito bites, intimate contact, and through the nose or mouth after touching an infected animal or contaminated surface. Generally, a healthy person’s body should deal with parasites effectively and prevent them getting a chance to take hold. However, when your immunity is low, your digestive system is functioning poorly, or intestinal flora is out of balance then parasites like intestinal worms can become a big problem, manifesting a variety of sometimes baffling symptoms. The difficulty in diagnosing intestinal parasites is that the symptoms often mimic other health problems. Experts in human parasites have said that a parasitic infection is a condition that commonly goes undiagnosed. Just because you have one of the symptoms listed below, does not mean you have intestinal worms. If you have several of the symptoms combined though, it may well be a good idea to seek advice from a knowledgeable healthcare professional. Choose someone who understands just how serious a problem this can be and how to treat parasites properly. Parasitic infection of the gastrointestinal tract can be responsible for ongoing intestinal bloating and excessive gas. This is due to the blockages tapeworms, rope worms and other parasites can cause in your digestive system and the changes they often make to the intestinal environment. Some human parasite infestations, like a protozoan infection, produce a substance that leeches sodium and chloride from your body, leading to frequent diarrhea. Conversely, parasitic worms can block the passage of digesting food or waste being eliminated, resulting in constipation. Worms can attach themselves to your intestinal walls, causing irritation and inflammation that leads to gastrointestinal spasms, contractions and poor nutrient absorption. All of these are common symptoms of IBS. The malabsorption of the nutrients in your food and stresses on your body due to a an infection of intestinal worms can lead to being in almost constant state of tiredness, low-energy and fatigue. This is obviously very difficult for the average doctor to diagnose and, unless there are more obvious symptoms, low level parasitic infections often go undiscovered for long periods, if at all. Parasites can cause irritation and inflammation in a gastrointestinal tract, making proper digestion difficult and leading to allergic reactions to certain foods. Leaky gut syndrome is often behind a sudden increase in allergies and improving your intestinal environment is the key to healing it, not taking drugs that mask the symptoms. Parasites steal energy sources, vitamins, minerals and other nutrients from your gastrointestinal tract during digestion. Poor immunity can result from this lack of nutrition, even if you are eating relatively well. Additionally, as parasites are constantly stimulating an immune response, over time they can lead to an exhausted immune system. This makes you vulnerable to other kinds of other foreign invaders like viruses and the candida fungus. Parasites are a serious problem and a lot more of us may be infected with them than we realize. This is due to the symptoms (and there can be many more than those listed above) often been explained away as something much easier to diagnose. If you’re having health problems like digestive issues, allergies and poor immunity, low-energy and constant tiredness and fatigue, it may be well worth your time to visit someone who understands just how much of a health issue parasites are and what treatments are available. The Global Healing Center has a more detailed look at the different kinds of parasites, their various symptoms and their effect on your body. I’ve used their Oxy-Powder and Paratrax combination in the past and felt much better in the weeks after using them. The Oxy-Powder I still use monthly as an intestinal cleanse, even though I have no reason not to think I’m now parasite-free. While those treatments are made from natural ingredients and oxygenated magnesium, I’ve always believed there’s a lot of value in homemade remedies for health conditions like parasites using powerful natural foods. Pumpkin seeds are a traditional remedy for parasites in Germany and next is how to use them as a treatment for intestinal worms like tapeworms, pinworms, rope worms, roundworms and other helminths. Pumpkin seeds have been traditionally used as an anthelmintic (a substance that helps expel intestinal parasites). Here’s a recipe for how to make them up for this purpose and use them yourself. Importantly, this pumpkin seed treatment for intestinal worms may not actually kill the parasites outright. Rather, it is believed the high levels of unique compounds known as cucurbitacins in pumpkin seeds paralyze the worms. This prevents them from attaching to the intestinal walls to prevent excretion, as they usually do during a bowel movement. The parasite recipe ahead contains quite a large amount of raw pumpkin seeds. This is deliberate, both for the high levels of cucurbitacins and to help you go to the toilet afterwards. 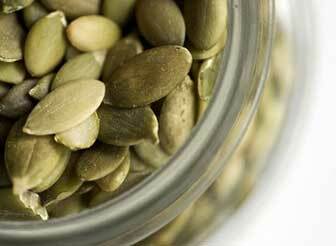 Pumpkin seeds are very filling so you’ll probably want to time it as a meal replacement. Early in the morning for breakfast is best. It is also strongly recommended to follow this pumpkin seed worm treatment with a natural laxative, such as triphala, to make sure that as many worms as possible are expelled before they recover. An oxygen and magnesium based cleanser like Oxy-Powder is also very effective for this purpose. You want the consistency to be like a smooth paste so start by blending in the coconut milk and then add the water in small amounts until it’s smooth and creamy. Getting the mixture out of the blender and into a bowl can be tricky. I find a rubber spatula good for these kind of jobs. Eat this pumpkin seed treatment for parasites, just like you would a porridge breakfast, on an empty stomach in the morning. It actually tastes quite good but is very filling and you may struggle to finish it. You can also add a few drops of blood sugar stable stevia to sweeten if you like. Store bought honey and especially sugar is not recommended though as these work against the purpose of the treatment and feed parasites. Within the hour make sure you drink a large glass of water. Several over the next hour would be even better. This is important to keep the pumpkin seed parasite treatment moving along and doing its work. Ayurvedic triphala powder is one of the few beneficial laxatives for occasional use and you can make it up around the same time as the smoothie and let it sit to increase its effectiveness. Use the directions for the stronger dose from the page on how to make triphala and drink it, with the sediment too, around two hours after you finish the smoothie and before you eat any solid food. Triphala at the higher doses should send you to the bathroom before too long, where hopefully the paralyzed worms will be expelled. If you don’t need to go to the bathroom after having this worm treatment, several glasses of water and triphala or another gentle laxative, then you are probably constipated and may need a stronger remedy like the Oxy-powder mentioned above the next time you make up this remedy. While some people may get good results with just one treatment, intestinal parasites like tapeworms, ascariasis and other parasitic worms are tenacious and making up the mixture multiple times is likely to be more effective. For best results make up this pumpkin seed parasite treatment first thing in the morning for at least two or three days (though no longer than a week, as laxatives shouldn’t be used for more than seven days in a row). Have a week off and then repeat the following week, preferably following this routine for up to a month to deal with the parasite breeding cycles. As mentioned earlier, there are many different types of parasites that can cause a variety of problems. While this homemade pumpkin seed remedy for tapeworms has been reported effective for many people, it may be best considered as part of an overall parasite treatment program. It is beyond the scope of this article to cover all that is involved in treating parasites once they get a hold. If you’re interested in much more on the subject, I’d suggest the Global Healing Center’s website and in particular their Paratrax parasite treatment formula, would be a good place to start. There are also several good online forums like Curezone, full of information on parasite symptoms and treatments. Many people have asked whether dogs can eat pumpkin seeds and whether this parasite treatment could be used for dogs with tapeworm and other worms. Actually, you can feed your dog pumpkin seeds and this blended up pumpkin seed parasite remedy is probably one of the most effective ways to do so. It could be mixed with their feed or a hungry dog would likely eat pumpkin seeds made like this straight from the bowl. Make sure any pumpkin seeds that you feed your dog are raw, not roasted and definitely not salted. Pumpkin seed dosage for dogs with worms has been suggested at 1 teaspoon of seeds per ten pounds of body weight. For best results though, it’s probably best to just let your dog eat as much as they’d like to, as long as they don’t get sick. Dogs have much shorter digestive symptoms so, in theory, this pumpkin seed remedy for dogs with worms should be even more effective than with humans. It would still be beneficial to treat your dog at least once a week for several weeks though to deal with parasite’s breeding cycle. I hope using pumpkin seeds for parasites works for you if you try it. I’ve answered many questions about the recipe and how to do the treatment in the comments below. I must state though that I cannot give any specific medical advice on parasites for individual people. If you suspect parasites but can’t get help from a regular GP then I’d recommend seeking out a specialist. This page has a list of physicians who specialize in medical parasitology and can be searched by state or country. I hope it’s helpful for some people out there as, from the many comments on this page and particularly the papaya seeds for parasites article, it seems to be hard to get parasite problems taken seriously and treated properly. Alternatively, traditional herbal medicine and Chinese medicine in particular have a long history of treating parasites and may be able to help. Make sure you discuss your concerns over the phone first and to check that the practitioner has experience with intestinal worms and other parasitic infections. I hope that the information on using pumpkin seeds for parasites on this page has been helpful and wish the best in your healing for anyone dealing with this problem. Since writing this article I’ve also investigated and written about using other traditional treatments for parasites like black walnut, wormwood and clove and papaya seeds and how to make a worm killing smoothie with them. Getting rid of parasites generally isn’t easy but I hope this pumpkin seed remedy for intestinal worms can be an effective tool in your arsenal against them. Brilliant advice, however is it safe to use for infants and toddlers. Also with respect to deworming is it advicable to have just the suspected person dewormed or does the entire family need to be included within the immediate household. Taking into respect we all share bathrooms. Hi Nafisa and thank you for your comment. I’d have to suggest checking this with a health care professional first. There’s nothing specifically in pumpkin seeds that should be a problem but it makes sense to be extra careful with toddlers and infants. There is a bit of an extra risk living in the same household but it would depend a lot on the digestive health of each individual. Parasites usually get a hold when digestion is impaired and the body’s defenses are low. That said, there’s no reason to not all have the treatment if you like. Pumpkin seeds are very good for you regardless of their effectiveness against parasites. Eating pumpkin seeds and going to order paratrax in a few days …not happy with the health care system that makes it hard to get medications for embarassing problems. The meds should be over the counter to treat worms. My dog is free of worms why shouldn’t I be. Thanks for the information. Hi Sue. I agree but many people find natural products like pumpkin seeds and papaya seeds work better than pharmaceuticals. Do you know if it is as effective to use other type of oil like flaxseed oil? Thank you! I’m eager to try this! Hi Qanta. Flaxseed oil can be beneficial for the digestive system and general health but I’m not aware of any specific effects against intestinal worms and other parasites. I sprinkle the pumpkin seed in my oatmeal. I do tjis with a parasite cleanse. I’ve cleaned house with the pumpkin seeds. I like pumpkin seeds in my homemade muesli as well. Can’t say I’ve ever used them for cleaning though. Excited to try this. Just did a pinworm treatment and I feel loads better. I would rather try a treatment that will murder the tapeworm instead of temporary paralysis… Laxitives are in my experiences are so painful. But if I can’t find any over the counter tapeworm murdering substance, this will have to do. Though I dont have symptoms.. ive used the bathroom and 3 times in a row ive seen a clear looking thing that I thought was a parasite. Its freaking me out. What do I do? I think a friend of mine may have intestinal parasites. He describes what he’s going through as a “spray,” which I find perplexing. He says he feels like dust or dander coming out of him and making It hard to breathe. He says they come out and get inhaled back in. He also bloats up a lot when this takes place, and it makes him itch all over. He even says the spray acts like its on a cycle and tries to irritate him every few hours, especially depending on what he eats. Does this sound like an issue to parasites to anyone? He has had this for many years, and now he’s changed his eating habits eliminating all sugars and carbs. Yet, he still has the problem, although sometimes it’s less irritating. Just would like to know if anyone thinks this is an issue with parasites and if you think pumpkin seeds can help. Hi Tracey. That’s an unusual description. I’d think it would be worth him visiting a good holistic practitioner who can really investigate his condition properly. The papaya seed smoothie for parasites on this page – https://superfoodprofiles.com/papaya-seeds-parasites – contains pumpkin seeds as well as is a bit more powerful than than this treatment. It can help with other digestive issues as well so it might be worth seeing whether he’d be interested in trying it. Hi David and thanks for your comments. This makes sense, though I think natural fruit sugars or unprocessed honey would still do the job without needing the soft drink or sugar. Do I grind up the raw pumpkin seeds with the shell on? Or do I use just the greed pumpkin seed? 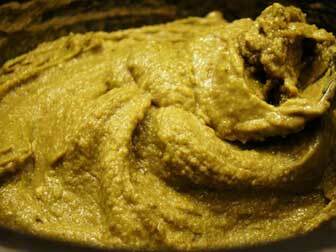 It’s best to use hull-less pumpkin seeds for this parasite recipe like Styrian or buy them already hulled. The link in the article is the ones I use. Triphala is a combination of three dried herbs and it’s best to get it prepared in powdered form. The one I use is linked to in the article and it’s one of the few laxatives that could be considered beneficial. Also it’s better to check a doctor if possible.. Have a good diet with high fiber food generally such as vegetables and fruits has a great benefits as well! It’s also true that a good diet is one of the best defenses against intestinal parasites. Thank you for your informative articles. I have been been heavily relying on your website as I try to kick out some pin worms. I confirmed sighting a large mass of dead worms ~March 7, but it is hard for me to tell when they started, because I have been having the nightmares I would associate with them for many months. It wasn’t until I saw the bodies that it all clicked what was going on. I had read in David Wolfe’s book Eating for Beauty that papaya seeds are effective at parasite removal. Wanting to learn more led me to your website. March 10, 11 & 12 I drank your papaya smoothie. I also added ~10-12 cloves. The best laxative I could find where I am in Germany was Senna tea. March 13 I tried a variation on this pumpkin seed remedy. The shake included – 150 g raw pumpkin seeds, ~12 cloves, ~2 tbsp papaya seeds, 1 tbsp coconut oil, and some chunks of pineapple. It is really hard for me to eat this,something with the consistency and harsh flavors, but I managed! It was hard to get down, but a few hours later there was what I would describe as 3 distinct, gelatinous sacs that came out. I felt good after this 4-day course, especially after the pumpkin remedy. Never sighted any adults again. I just want to share my story here, to document it, in case it helps anyone else. Hi there and thank you for sharing this with people. I think the reason the mix is so hard to get down is the number of cloves, which at this level do tend to overpower everything. I’d suggest mixing up the smoothie without them first, pouring out 90% of the smoothie and leaving just enough in the blender to cover the blades. Add the cloves and blend them up. You could then shot down this small amount without tasting it too much and follow it with the much better tasting main smoothie. I actually enjoy having it and think this is important for following through with it. As I said in the (admittedly very long) post, with parasites it’s worth repeating the treatment multiple times to take care of the breeding cycle. If you can do this treatment for 3 – 4 days every fortnight for 2 months it should be very effective, especially since you’ve already seen results with it. Thank you as well for the link. That looks like a very detailed thread. I’ve saved it and will have a read when I get the chance. I am a very active person, I bike to school and back(2mi each) and workout almost every day at high intervals. I eat very healthy too, I don’t drink, smoke, do any illicit drugs..and I rarely even take say an aspirin. I don’t eat aspartame products such as soda either. My problem is,..the past 4 years I would say…my stomach has been very distended similar to those with Korsakoffs syndrome. I am about 5 ft tall, and built like a gymnast. But my stomach looks distended from when I wake up to when I go to bed.I don’t snack at night either. I want to know how to stop my stomach from being distended. Is there breathing exercises I can do..that will permanently help get it flat again? Its very frustrating, bc I look pregnant(I am not),eat very healthy(bread, veggies, fruit, drink lots of water, apple juice, grape juice, meat, soy milk..that kind of thing) and I workout all the time, and Its very frustrating. Does anyone know of this..if so can you please help me? Also, I am not gassy often. I was told that PUMPKIN seeds could do the trick, because that person thinks I might have parasites internally. How do I know? I’ve seen little grey clearish tiny worm things come out..but i didn’t know if thats a worm..or a parasite. Can you please help? I’d recommend having a read of this article on using papaya seeds for parasites as I now consider them more potent: https://superfoodprofiles.com/papaya-seeds-parasites This recipe uses pumpkin seeds as well. There’s also additional information at the end of the article on finding a specialist as most GPs don’t have a great deal of experience with testing for or treating parasites. Many people have found the papaya seed smoothie in that link effective but parasite cleansing can take some time to do properly. The Curezone forum is also a good source of information, including on how to clean the home, clothing and bedding and the various other treatment options. You might find that if follow an elimination style diet and remove potential allergens like gluten, grains, soy and those high sugar fruits / juices that may be feeding parasites that your tummy will flatten down. I tend towards a cyclical ketogenic paleo diet and find it to be beneficial for digestive issues especially ones where you want to limit sugars (especially simple sugars) as they can feed the bad guys. Hi! Wondering if i cud replace the products suggested to a diff type…for example, cud i use triphlax capsules rather than triphala powder? And get the same results? also, cud i replace paratrax with Sun Force ParaRx? Latero-Flora with probiotics capsule from innovative health? I haven’t tried those products so can’t speak to their effectiveness. I would say you need a significant number of triphala capsules to match the powder. At least 5 grams or more for the desired effect. An earlier commenter had an interesting theory on the honey which is part of the traditional parasite therapy. Since worms are attracted to it they also come in contact with the compounds in pumpkin seeds which paralyze them. Perhaps salt would have the opposite effect. Garlic is a known parasite killer so this could be helpful, but obviously not to everyone’s taste for breakfast. Now that I am home, I’m gnoshing on 16oz of organic raw pumpkin seeds right now (from Costco), I will toss down some garlic cloves with honey for good measure. Then I am following up with doses of a different natural laxative… Don’t know the benefit of the paste vs just chewing them up well like I am doing. I hate to go the pharmaceutical route, but, based on the amount I saw, may be prudent if this doesn’t work. Chewing up the pumpkin seeds is fine. I just found blending up the paste a little easier as it comes out like a porridge for breakfast – the best time to have a parasite treatment. If this method were to be used on a tapeworm, like 5 feet, what would happen? You said they get paralyzed making them unlatch, but if the worm is very long how will you expel of it’s paralyzed body. Would it hurt? Would it be a bad idea to try this on a tapeworm? In this post https://superfoodprofiles.com/papaya-seeds-parasites a lady named Patrice commented that she had a ten foot long tapeworm come out after making up the recipe there. Without the ability to latch on even larger parasites will be expelled with a bowel movement. There shouldn’t be any pain with this. Papaya seeds wouldn’t be unhealthy for children but I’m hesitant to recommend treatments for young children as they are not able to explain any reaction they may be having. I’d recommend discussing this with a knowledgeable health care professional. Yes, I’ve used salted and roasted variety… they worked for me. But they too salty to consume forever. I wash mine in a colander to dislodge some salt. But I agree, the raw variety are a better option and probably more available than the salted variety. I just took a large handful with each meal for a few days. Tried to keep the house clean too and wash things more often than usual. But I like the related suggestions about pineapple and papaya… I think a combined approach makes the most sense. The commercial salted pumpkin seeds are way too salty for me. Raw are much healthier and you could still add a little olive or avocado oil and sprinkle them with a small amount of real salt if you want to occasionally. Doe this work for eye parasites?? This really works. I was having this problem of parasite since 2 years. I mixed pumpkin seeds with GUR it is same like sugar. You can blend them and eat 1 tp daily. I was having IBS vibration on daily basis before or after food. Within 3 days of eating. It all finished. IBS was gone. I am taking it regularly. Apart from it, it has improved my digestion, immune system. No flu or cold. It has regulated my body temperature. You can eat them raw too 100-200 grams daily. Hi Ali and thanks for your comments. I’m glad you’ve had such good results with pumpkin seeds, particularly for IBS. It’s an area I’ll have to look into in the future but I’d expect high potency green black walnut hull extract would have a better chance for eye parasites as pumpkin seeds seem quite specific for intestinal worms. Can i apply this on my 4 month old son? This pumpkin seed recipe can help with tapeworm in particular but the papaya seed smoothie on this page with pumpkin seeds seems to work better for most people https://superfoodprofiles.com/papaya-seeds-parasites You can read the comments to see the results people are getting. There’s nothing in particular in pumpkin seeds that I’m aware of that children shouldn’t have but I always recommend checking with a healthcare professional with children that young. Do you think one could just fast on pumkin seeds for three days and that would deworm the body? The difficulty with parasites is interrupting the breeding cycle. Even when a treatment is successful eggs laid can hatch so usually repeat treatments are recommended for at least a month. Apart from examining BMs are there any over-the-counter tests you can take to check for parasites ? What about doing pumpkin seed oil capsules. Do you think that will work as effective as the recepi? I don’t think pumpkin seed oil capsules would be as effective as you are only getting the oil extract which isn’t known to be high in cucurbitins to paralyze the worms. Hi! Thanks so much for your informative article! My question is, once I ingest the pumpkin seed mixture, how long are the worms paralyzed? If I eat it today but don’t pass them until tomorrow morning, will they “wake up”? Please help! I’m so grossed out! It appears it might not be for more than a few hours, possibly longer but I don’t think overnight. This is why the recipe is actually quite a large amount of pumpkin seeds and it’s recommended to take triphala https://superfoodprofiles.com/how-to-take-triphala-churna afterwards to stimulate a bowel movement afterwards. Obviously it takes a while for the pumpkin seeds to get through the digestive tract but in my experience this method helps gets them through quite quickly. Here is the story: you have to go to doctor and get tested. I am reading on this site, that almost everybody is guessing about the parasites. Of course, in some countries, testing is not available. My test result was showing that I have 3 different parasites: Dientamoeba Fragilis, Trophozoites and Blastocystis Hominis. There are more than 300 different parasites, so its very difficult to find the right treatment for these 3 parasites. My doctor prescribed antibiotics. There is about 50% success rate with most antibiotics, so I will not take them. If you are not cured by the antibiotics, you will be much worse off, because it will kill all the good bacteria in your system. I have done 3 weeks with pumpkin seeds, 3 weeks with diamacious earth and one week with wormwood. No help for me. To be exact, it helps first day or two and then these bastards will return and live like nothing happened. I hope this helps others. JIM, question for you: are you familiar with these 3 parasites and anything you could recommend? These parasites seem more difficult to treat than intestinal worms, though I’ve read on forums like curezone.org of people having success with high strength oregano oil enteric capsules. On the subject of parasites I’ve also written about papaya seeds https://superfoodprofiles.com/papaya-seeds-parasites and green black walnut hulls https://superfoodprofiles.com/black-walnut-parasites-intestinal-worms both of which I consider to be more powerful than pumpkin seeds alone, though they are included in the first treatment. Do squash seeds (butternut or acorn) work like pumpkin seeds on parasites? The reason I ask as these squash are available throughout the year and I can almost avoid buying pumpkin seeds if these work. Honey and milk are both wonderful if they are raw and unpasteurized which is most likely the kind prescribed in the anti parasitic mix! The belief that sugar feeds parasites is only half true. Refined sugar from baked goods, processed foods, etc feed parasites because they are acidifying, take longer to digest and sit in the gut. Fruit sugars are digested and absorbed easily and raise the body’s alkalinity, which make the body environment less favorable for the parasites. Parasites are low frequency beings, therefore to get rid of them, we need to raise our frequency by eating live foods, thinking positive thoughts, letting go of our emotions and creating an environment where we thrive, not our parasites. There aren’t any commonly reported side effects from eating raw pumpkin seeds without the hulls as suggested in this recipe. It is very filling though. Thank you for sharing this useful information. I live in Kenya( East Africa). People here know very little about natural alternatives. Am hoping to spearhead the awareness. How effective are spices like Cardamom, Fennel, Ginger, Nutmeg, Oregano, Cayenne, Bay leaf, Mint, Thyme and Apple Cider Vinegar. Unripe paw paw is said to kill round worms. Pomegranate juice and bark are also said to be good. Has anyone tried them? I made the recepie, it was a pale grey-green. Unfortunately, in couldn’t finish. I’m eating pumpkin seeds everyday. I have blastocystis hominis and have to get rid of it I a month cause I have trip and will be very hard to keep with my diet, ofcourse if I would eat something that is out the diet it will grow the parasite. I agree the recipe is filling. There are also links to other parasite protocols in there. Not sure how old this post is but you don’t want to kill inside of you but rather paralyze because parasites naturally thrive in a sick body generally because a lot of toxin has accumulated and it’s their food. When you kill them, it expels all the molds, mycotoxins, heavy metals, ammonia etc. it’s been eating in your system. You will feel like it’s killing you in the process…. Yes the pumpkin seed parasite recipe is very filling.